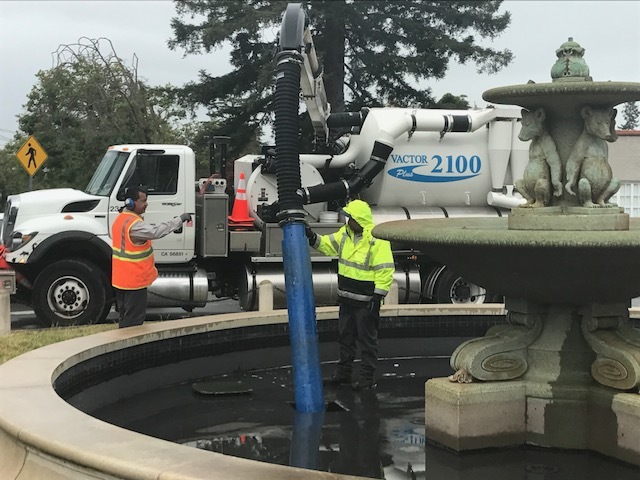 Update, June 8: City workers today pumped out the contaminated water from the Fountain at The Circle and will refill it. According to an article on the recent rash of soapings posted on the news website Berkeleyside.com, the city estimates the expense for this operation at $1,000 — that’s each time it has to be done. So please help us prevent this from happening again. 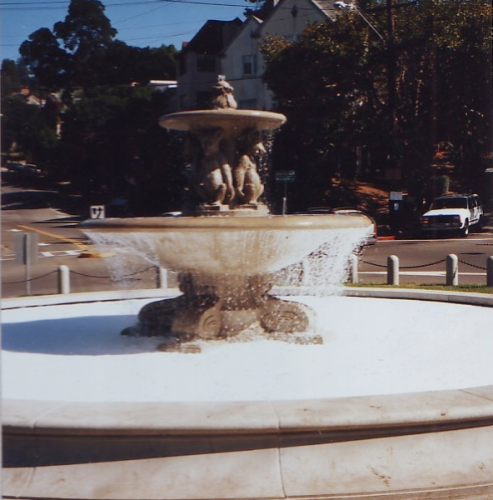 If you see any suspicious activity around the fountain, please contact Friends of the Fountain and Walk at 510-982-9738, or call the city at the non-emergency 311 line. Thanks very much. You may have noticed that our beloved neighborhood landmark is once again not operating. That is because just days after we got it up and running again after vandals put liquid detergent and dye into the water, someone put more soap into the fountain this week. If you are going by today, you will not see the visible effects of the soaping, as the foam has dissipated and the water looks normal. But if we turned on the pump mechanism again without draining the tainted water — which recycles through the fountain’s efficient operating system — the pool would be full of soap bubbles again in short order. We expect the city to be able to drain and refill the fountain Thursday or Friday, so we hope it will be fully operational again by this weekend. This is the third vandalizing of the fountain in just a few months’ time, and the sixth or seventh in just over a year. While soaping the fountain might seem like a fun and harmless stunt, it has major consequences. It takes hours of time spent by both city staff and FOFW volunteers to right things. It wastes thousands of gallons of precious water. It shuts down one of our city’s most historic and well-loved landmarks. We appeal to all neighbors and fans of the fountain: Please spread the word that polluting the fountain is wrong. While it may seem like innocent fun, it is an act of vandalism that hurts all of us. And it accomplishes nothing more than ruining enjoyment of this treasure for everyone. We at FOFW are looking into ways to try to prevent this from happening again. District 5 Councilmember Sophie Hahn has pledged her support to help us do that. We will keep you informed about any actions that might be taken. But probably our best defense against this, short of monitoring The Circle 24 hours a day, is your help in discouraging this behavior. Help us promote the value of this precious and vulnerable resource. It belongs to all of us; we all need to help care for it. Thanks for your support. Check back for updates here. Cameras at homes on circle? Drag to have to do that but perhaps making it known would be sufficient deterrent. Hello, Beth. Thanks for your comment. Security cameras have come up for discussion. It is debateable how effective they might be, and there are concerns about privacy issues. But our board is looking into that and other possibilities for trying to deter things like this from happening. Meanwhile, we continue to ask our community to a) discourage this kind of behavior in any way they can and b) if they witness something happening at the fountain that raises concern, to report it by contacting us (call 510-982-9738) or BPD at 311. Thanks.